Magnesium is a trace mineral that is required by every cell in the body and is involved in several hundred different biochemical reactions. Half of the magnesium stores are found in the cells of body tissues and organs; and half are combined with calcium and phosphorus in the bone. Magnesium, like calcium, is an essential bone matrix mineral that is required for healthy bone metabolism. Magnesium also supports cardiovascular health by helping to maintain healthy levels of cellular and plasma electrolytes, including calcium and potassium. It also contributes to the integrity and maintenance of the teeth. 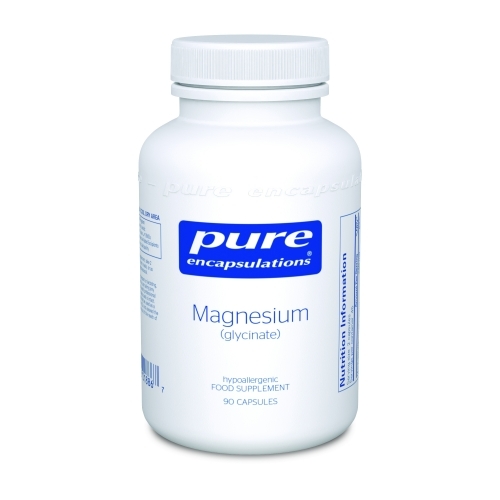 Magnesium activates the enzymes necessary for a number of physiological functions, including neuromuscular contractions, cardiac function, and the regulation of the acid- alkaline balance in the body. It is also crucial to normal psychological function. It is necessary for the metabolism of carbohydrates, amino acids and fats; also for energy production, and the utilization of calcium, phosphorus, sodium, and potassium. This vital mineral also helps utilize B-complex vitamins, vitamin C, and vitamin E and contributes to normal protein synthesis. Magnesium in citrate, citrate/malate, and glycinate forms are highly bioavailable magnesium chelates, supporting the metabolism and utilization of many essential nutrients and the proper functioning of important enzymatic and physiological functions.